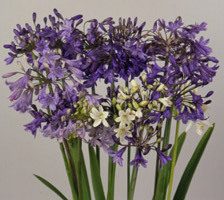 African Lily, or Lily of the Nile is a tender herbaceous plant native to Africa bearing large umbels of blue or white blooms. They are hardy only to 10F (-17.7C) and must be protected in areas colder than this, thus they are most often grown in large tubs or containers in cooler climates. In warmer ones, they can be used in the flower bed or border with good effect. The plants thrive in a rich soil in a sunny location, 1 part leaf mold, 1 part well composted matter and 2 parts loamy soil, being the best medium in which to grow them. 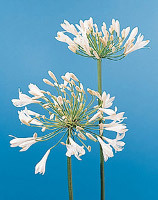 The plants may be propagated by seed or by digging and dividing in the early spring. Seeds should be sown in pots, trays or prepared beds, covered lightly, then kept moist but not soggy at about 60-70F. The seeds germinate slowly, sometimes taking 12 to 14 weeks. When seedlings reach 2 inches in height, they should be transplanted to larger containers and allowed to grow on. Successively larger containers should be utilized as the plants grow until they are large enough to be planted in their final location. In established plants, the rhizomes may be dug in the spring and the largest cut into pieces, each with a few roots attached, then replanted.